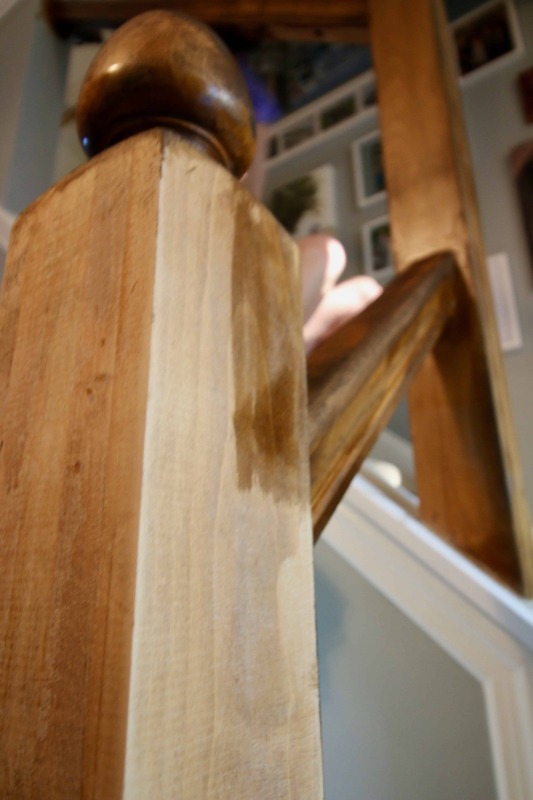 How to Replace Wooden Balusters with Iron the Easy and Cheap Way! 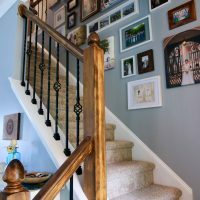 You are here: Home / Home / Home Projects / How to Replace Wooden Balusters with Iron the Easy and Cheap Way! Talk about a transformation from ’90s to modern! Updating our railing and balusters has been one of the easiest and biggest transformations to move our house away from 1993 to 2017. We updated our stairwell railings by sanding down the orange-tinted oak railings and staining them with Minwax Dark Walnut. 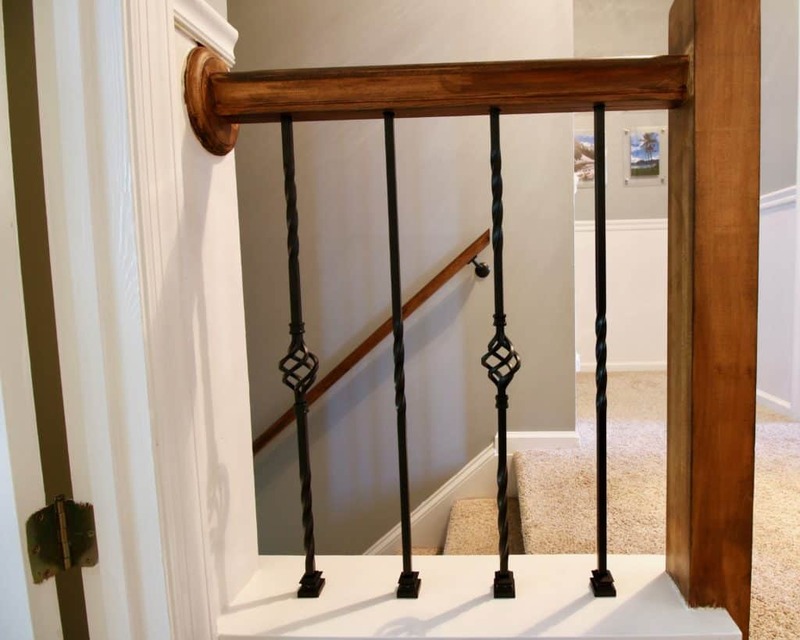 Then we replaced our white wood balusters with new iron ones and it’s a totally different room! See the final hallway makeover reveal! Click here to sign up for our weekly DIY newsletter! Click here to pin this project to pinterest! 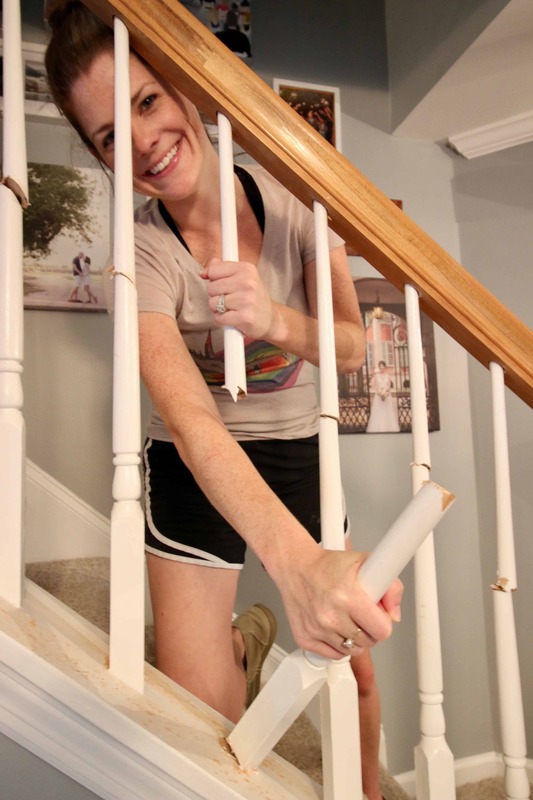 The first thing we did to make this project happen was remove all of our old white wood balusters. 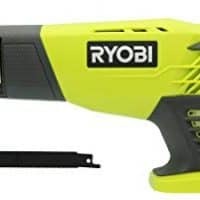 Using our awesome RYOBI One+ Cordless Reciprocating Saw, we cut an angled slice through each baluster and twisted them until they popped off. They were nailed in with a brad nailer, so we had to wiggle them until the nail came loose. Then, we used an orbital sander to buff down the old orange-tinted oak finish on the railings. We used three sander discs because of the amount of hidden gunk and sealant that was on these things and kept ruining the pads quickly. We buffed them down all the way and then wiped everything with a damp rag. The next step was to stain and seal the railings. 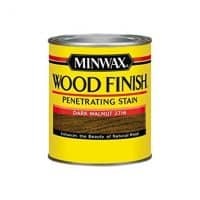 Like we said above, we used Minwax Dark Walnut that we have used on a ton of other projects and is basically the same color as our floors downstairs. This keeps a cohesiveness through the space and looks elegant. Then we put five coats of matte polycrylic on the whole thing to keep them from getting warn down by people holding the railings. Finally we added our new iron balusters. We ordered them on eBay for a great price. There were tons of design options, but because the space was so small, we didn’t want to have anything too elaborate. We opted to alternate two designs (a single swirly on one, a basket in between two swirlies on the other) that were fairly simple and wouldn’t be distracting, yet were also elegant. To add your own iron balusters, you need to cut them to size. Make sure to measure how deep the hole is in the railing, then how far the distance is between the railing and the bottom. 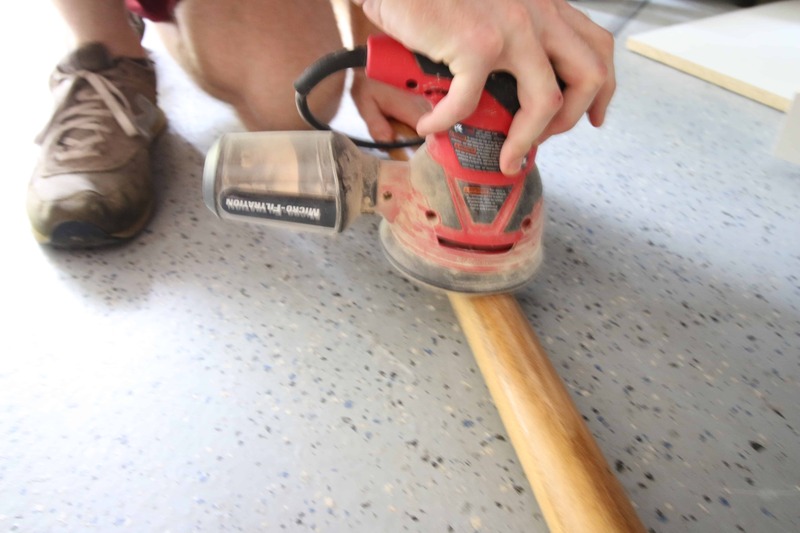 Add those together and cut your balusters from the center of your design to be that length. For us, it was 30 inches. 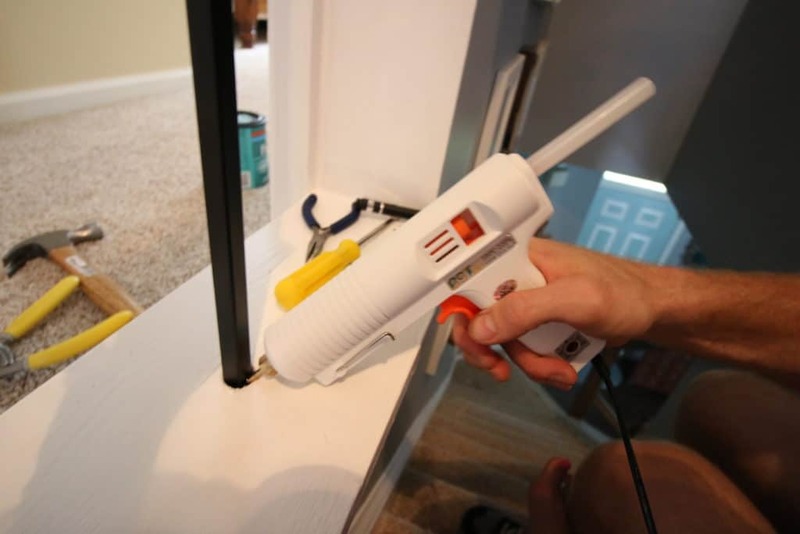 This is so you can slide the baluster up into the hole at the top, then drop it down to the board at the bottom. 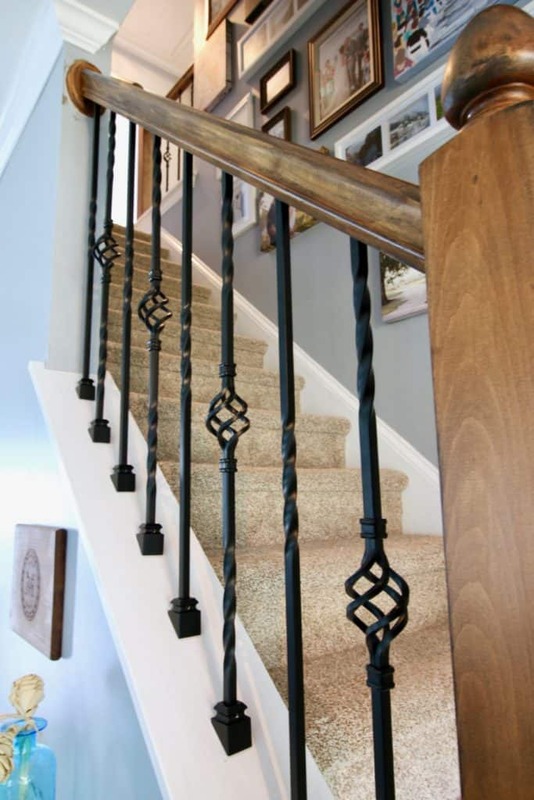 Wondering how to cut iron balusters? We used our RYOBI reciprocating saw to cut the balusters to length. They were easy to cut using a fine toothed saw blade. We marked the cuts by putting some Frog Tape where the cut should be and then buzzed it down. 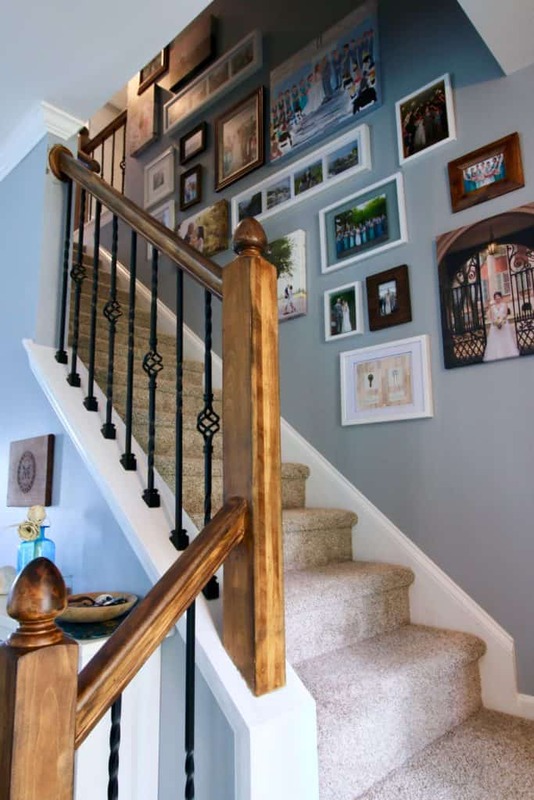 Two things to remember when adding the balusters. 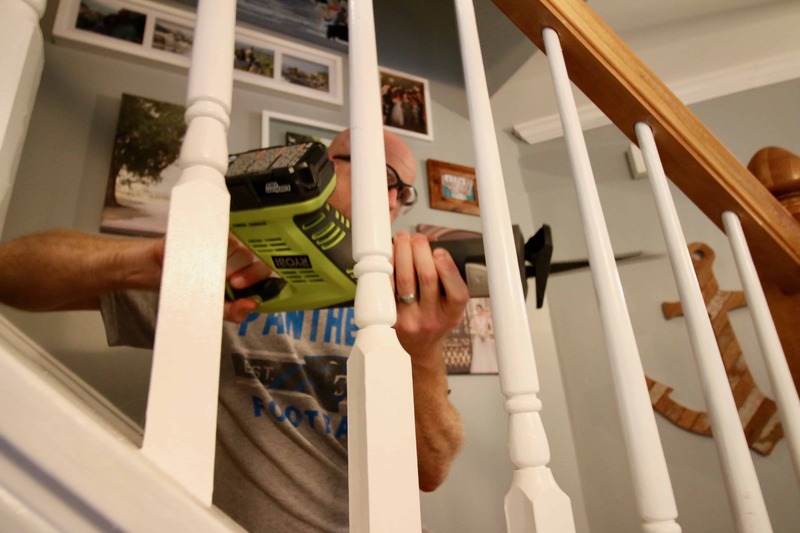 First, make sure you put the shoe on before you insert the baluster into the railing or you’ll have to pull it back out. The other is to use hot glue to hold them in place. 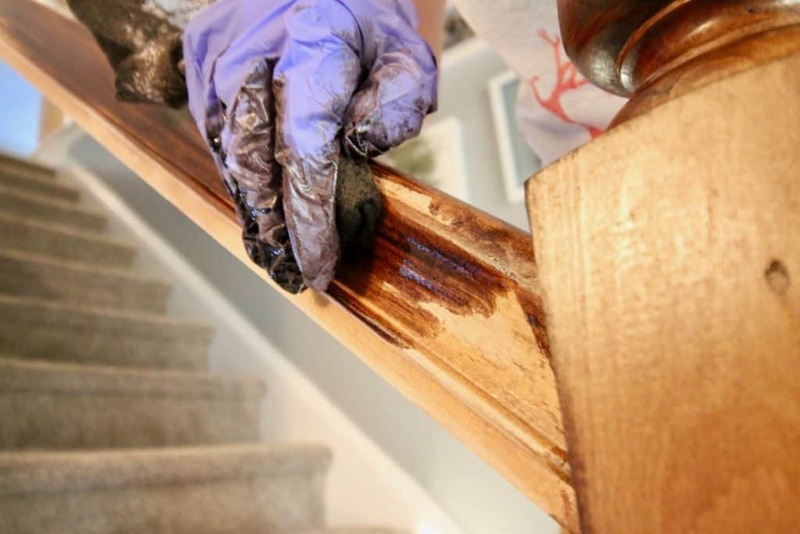 When researching what kind of glue to use for iron balusters, most places say to use epoxy. But, that makes it VERY permanent and is unnecessary. 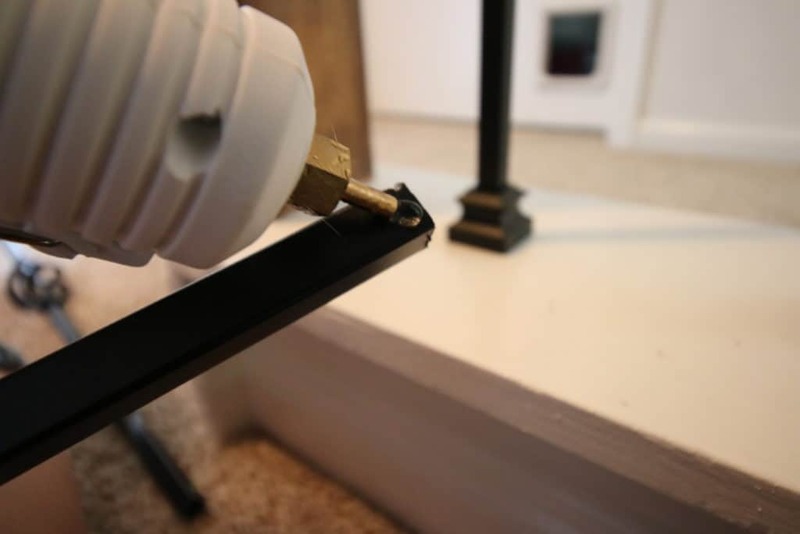 Put some hot glue onto the end of the baluster, then insert it into the railing hole and adjust it down. The glue will dry quick so don’t mess around. Then put a little hot glue around the bottom of the railing and drop the shoe down to cover it up. This is truly a transformation. The project took a few days because there were several steps that required waiting (staining and sealing). But, it wasn’t difficult. The cutting and removing of the old balusters took about an hour for our space. Sanding took an hour and installation of the new balusters took about two hours total. It was a lot quicker after the first few when we got in a rhythm. Updating our railing and balusters made the space look incredibly different and so much more modern. 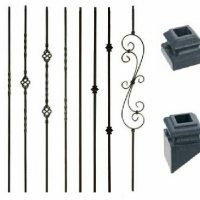 Iron balusters are also available at hardware stores like Lowes and Home Depot, but we found the best price on eBay. **Note: this is just the cost for the railing and balusters at the top, since that hallway is what we are making over for the $100 Challenge. We also updated the downstairs railings since we were already at it, but I didn’t include that in this total. I hope that makes sense! 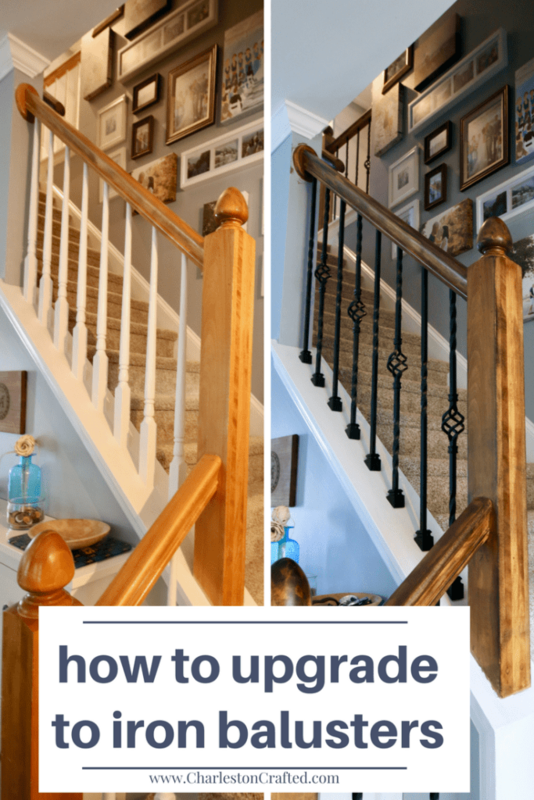 rise you how easy and inexpensively you can do this upgrade! Use a reciprocating saw to saw old wooden balusters in half. Pull out and discard. Sand the railings left behind. 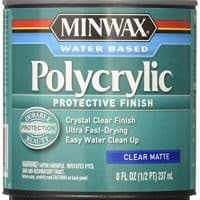 Stain or paint as desired. Measure the height needed for each new baluster, including length to go in the hole in the railing. 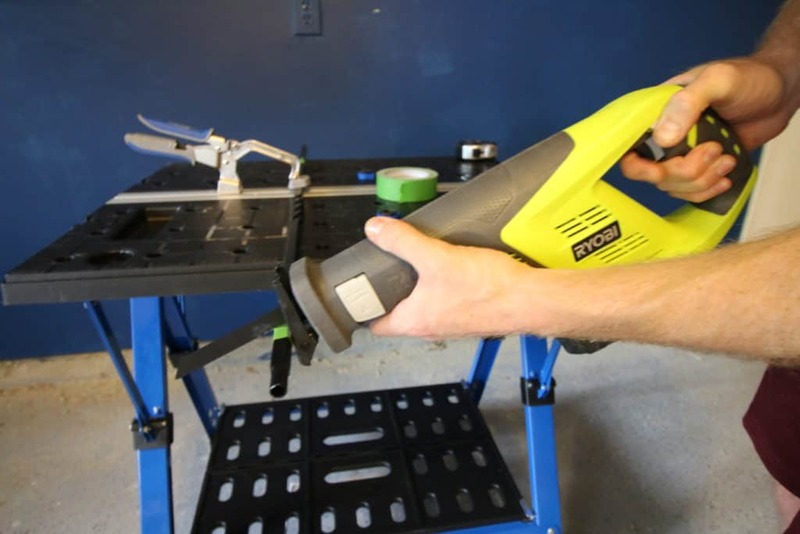 Use reciprocating saw to trim to length. 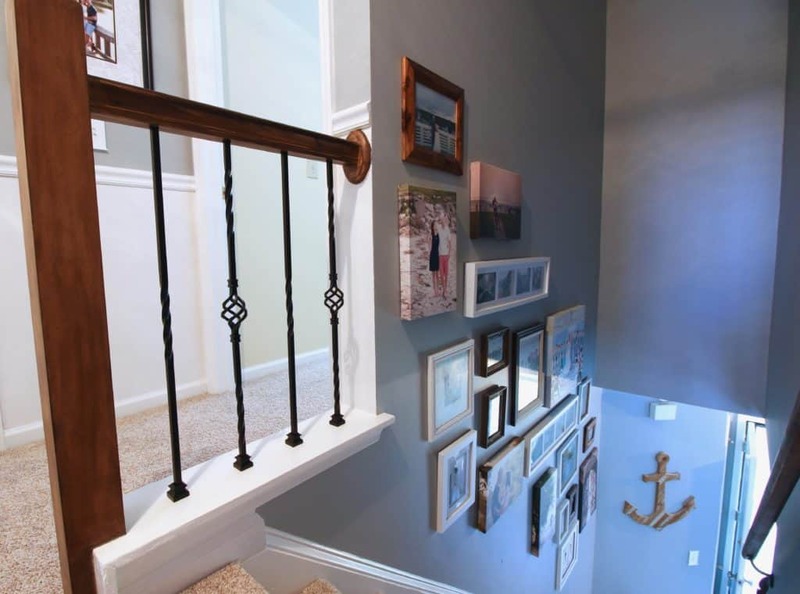 Insert the balusters into the railing. Add a drop of glue to hold them in place. I am loving all of the updates on this challenge and next week is the reveal! « What’s the Easiest way to Paint a Door: Roller or Sprayer? Love the things you’re doing. Keep up the interesting and good word inspiring the rest of us! Thanks so much, Gail! We’re glad you’re enjoying the journey. Let us know what you’ve been up to! Did you check the City/ State code? It looks like they are too far apart a child can get their head in there and get stuck. and yes there is a specific code that pertains to this. NO children in the house, no big deal. When you sell it could be a big deal. We did not move or change the location or spacing. Updates it from builder grade to luxurious. Beautiful!